If you’re running ads to a webinar, your primary goal is to increase webinar attendance, right? That’s where your sales come from – the people who actually show up and hear what you say. 85% of our clients run ads to a webinar, and this is the marketing strategy Team Hirsh has *perfected* start to finish. Click on the link below to tune in, and then tell us what you think: Where can you improve your own strategy today? [2:44] Crappy show up rates? Start here. [4:44] But – it’s not enough to increase the show up rates, you also need THIS. 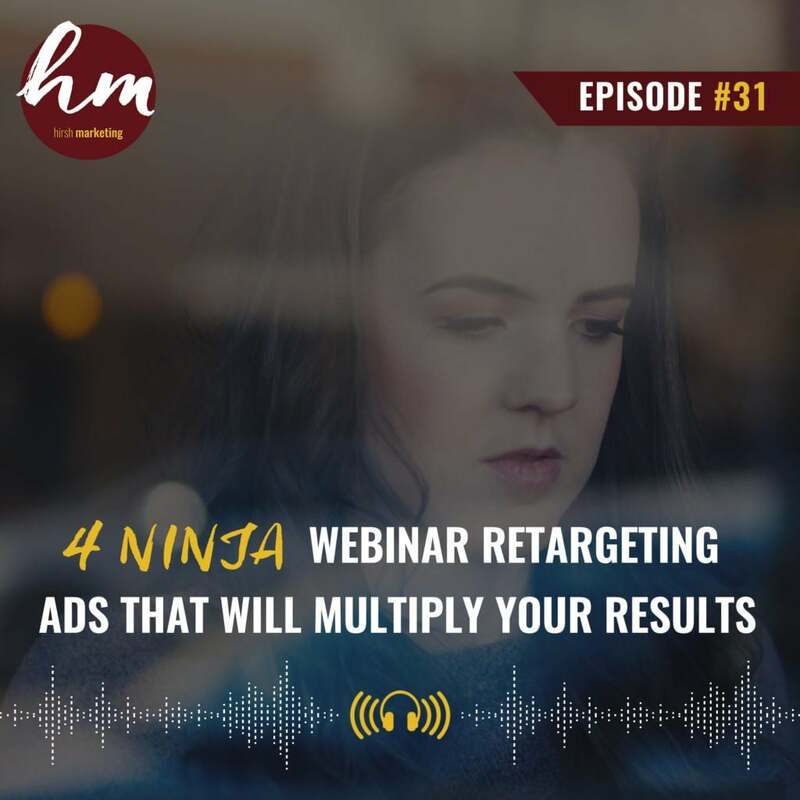 In today’s episode, I’m going to share with you guys some of our webinar secrets, and 4 Ninja ads we basically implement for all of our clients. Webinars are kind of our jam. I’d say 85% of our clients are running traffic to a webinar. We do a lot of other ads, but webinars have just become our jam because of the people that get referred to our agency. So we’ve really perfected the strategy, and I’m super excited to share this with you guys today. A few of the things that I share are going to be a relevant to live ads or live webinars vs evergreen webinars, and I will point that out, but just keep that in mind on some of these, like it wouldn’t make sense for an evergreen webinar. However, a lot of our clients, in the beginning, when you have a live webinar, and you’re testing the webinar itself, a really great strategy is kind of treating it like an evergreen, ongoing campaign where the ads continue running, but you do a weekly or a bi-weekly live webinar. And what that does is, you can keep the ads on, and you just change the date on the page, on the landing page itself, so that the ads don’t have to continually re-optimize. But you’re able to test a new webinar until you feel like you’ve perfected it. Russell says to do that for a year. I have yet to have a client do it for a year, because we’ve perfected it sooner, and gotten the conversions we want. Also, real talk, I think people don’t want to do a live webinar for a year. But, Russell does say that. And if you don’t feel like you’ve perfected it, you should continue on doing it until you feel like you’ve perfected it. A lot of our clients, we run this cycle with a weekly live webinar. So, the 4 Ninja ads: and this basically happens after the person signs up for the webinar. So obviously we’re running ads at the top of the funnel for visibility and brand awareness and then directly to the webinar, but these ads that I mentioned are going to be after someone has already registered and so they’re all retargeting ads. The first one is a 24-hour reminder ad. This is targeted to everybody who signed up for your webinar that you run for 24 hours before the webinar happens, that basically says “Hey, you’re signed up for blah, blah, blah training. It’s happening at this time in the day. Comment below. I’ll see you there or say hi and introduce yourself if I’ll see you there,” whatever it is to get them to commit that they’re coming and it basically serves as a reminder ad, just the same that you’d send a 24-hour reminder email. The purpose of this is that we’re trying to get attendance rate up. You can get super tricky and you can connect it to Manychat, give away something. It’s hard because it’s only 24 hours so it only runs for a short period of time. You don’t really want to run it longer, like the point is that they see it when the webinar is almost happening and that you have the date and the time in it. So if we’re doing a weekly live webinar, we do a new one of these, changing out the date and time every single week. You could also make a video, which could be effective with the person connecting with you. The point of it is to get your live show up rate up, because in between the time when the lead signs up for your webinar and then the webinar happens, our goal with everything we do in our marketing emails and ads, is getting them to show up live, because the more people live, the more people you pitch to, the more sales you get, the more ROI you get from the leads that you already paid for. So, 24-hour reminder ad for your webinar is super important. If you have something you’re giving away or there’s a reason for them to attend live, put that in the ad copy. If there is a testimonial from somebody who’s watched the webinar, put that there, whatever gets them excited about showing up, marking it on their calendars and remembering that it’s happening. The next one we run is an engagement ad. Maybe I should have said this one first because it actually runs right away. After somebody signs up for the webinar, and in between when they sign up for the webinar and the webinar happens, we run an engagement ad that basically is just asking them a question, and it’s like, “Hey, we know that you signed up for this training. We’re super excited to have you,” and I’ve said many times before, “Comment below a question you have and I will try to call it out live and answer it on the training.” People really like that. Or I say, “Comment below and tell us your number one struggle,” or whatever it is you want. People love to talk about themselves, but the key with this is that they’re engaging with you. Again, they’re gonna see this ad in between when they sign up for the webinar and the webinar happening, so you’re staying top of mind for them, and you want them to engage. This is probably the best ad of all the ones I’m gonna say to connect to Manychat, because then you can have them in your Messenger inbox as well. We’ve done things like have a worksheet PDF that we hand out on the webinar or for the webinar. If they comment on this engagement ad, we’re giving it to them, and so we’re saying that. A video works well here too because again, building that relationship with you, you staying top of mind, all important with the main goals is get them on there live, but also get them on there live, but also get there with already a factor of trust for you because they’ve already engaged with you in some way. So, whatever that engagement ad is, it’s asking them a question, you’re running it … I’m saying engagement because you’re running it as an engagement objective in Facebook, and same with the 24-hour ad. Both are engagement objectives. You could run the 24-hour ad as a reach if you wanted to test that. I usually run it as engagement, but engagement ad, get them to comment, stay top of mind. You can really time this with either … I would just use the thank you page pixel for the audience versus having to update the list everyday in Facebook. If you have Facebook Ads Manager somehow connected through the API tier email list, like active campaign does that really well, then you could have an audience auto-populate. But really you could make the audience people who have visited the webinar thank you page in the last five days, and then they see this engagement ad. The thing if you’re doing a weekly live webinar is you have to make sure you exclude everybody who’s already signed up for past webinars. I don’t want to get too crazy complicated, but what’s annoying is if you have to update the audience every single day, like with the CSV file that’s super annoying, so ideally you either make Facebook talk to your CRM, automatically somehow connect it, so the audience is automatically updating each week, or you use the thank you page, so again, the audience is automatically updating. The next Ninja webinar ad that we run is the replay ad. Instead of going straight into re-targeted sales ads, this is for somebody who signed up for the webinar and didn’t attend, and you are offering a replay. This is where you would send them either straight to the replay to go and watch it, and you’d run this for only 24 hours after the webinar because you want to get into the sales ads, but we still wanna squeeze out as many people as we can watching the training because it will ultimately lead to more buyers. This replay ad, it can be used for Evergreen too, so you can constantly … if you have an automated webinar that runs three times a day or once every single day, you can constantly be funneling people in who didn’t watch the webinar into replay ads, so they see that for the first 24 hours instead of sales ads, because we want to get as many people as we can watching your webinar. I would show that either go to the replay or re-register. I prefer the re-registering if you can make it work with your funnel. If you can’t, then it’s okay to send them straight to the replay. I just feel like if someone’s scrolling on their phone, they won’t right them have 90 minutes to go watch the webinar. This is a great ad to put in testimonials from people who even commented during your webinar and was like, “This is so much amazing information. I can’t believe it,” or whatever they’re saying because again, our ultimate goal is to get them to watch the webinar, and so if we get them excited about the content on the webinar, that’s what we are trying to do. The replay ad, I usually run it as a link click objective. If you’re re-registering, you could run it as conversion. The only downside is sometimes link click just gets more traction, so either that you reach will get more people faster, because if we only have 24 hours, so if we sometimes run it as a conversion ad, what we’ve noticed is it spends a little bit slowly, because we only have 24 hours and the audience is most likely not gonna be massive, so I normally run it as a link click or a reach objective ad for the replay. This can be used for live webinars, Evergreen webinars, weekly live webinars, launches, all of them. You basically are segmenting the audience of people who didn’t watch your webinar. Obviously depending on your platform, it’s gonna be different how you can pull that audience. If you are using something like Clickfunnels, you have to just go off did they visit the broadcast room and pixel that page. That’s not my favorite way to do it. Ideally you have something like Everwebinar or GoToWebinar, or WebinarJam that’s actually telling you the email addresses of people who didn’t watch. The final 4th step in final Ninja ad that we run in our sequences is the sales ads. That’s probably the most obviously one is re-targeting people with sales ads after the webinar, so whatever you were pitching on the webinar, you are targeting your webinar attendees with sales ads. Now I normally, and I’ve done a podcast on sales ads, so go back and listen to that if you want detailed of what sales ads, ’cause you don’t just like want one or two, you wanna be really strategic with what sales ads you show, how many you show. A common thing is on these Evergreen webinars for our clients is they’ll do a webinar on Thursday and the cart closes every Sunday for that round of webinar attendees, so it’s like a 2-3 day usually open-cart if it’s not a live launch. During that time period we are running sales ads to all of the attendees. Now, I usually mix it up so each day there’s a new ad. There’s also abandoned cart ads, which I’ve talked extensively about in previous podcast episodes, and then also you wanna have a different ad for somebody that did sign up for the webinar and didn’t watch it yet. If you’ve already gone through the replay ad and they still haven’t watched it, and you still want to show them a sales ad, it’s going to need to be a little bit more in-depth of a sales ad and give them more information, like a video would be great here because they haven’t watched the webinar, so they haven’t had that nurturing. If you know people have watched the webinar, you can have a specific ad for that because you can be a lot more direct. If they’ve attended the webinar, they’ve already connected with you and your content, your message. The trust is there. It can be a little bit more short, direct, just get them to the sales page. Get them to buy. Of course, I’ve said it many times in other podcast episodes, but I can’t forget about the abandon cart ad, and I have to say it here too because you need an abandon cart ad. You wanna hit anyone who’s landed on your sales page or your cart with specific ads, ideally video, talking to them about the fact that they were almost there, they almost purchased, whatever the objections might be, breaking those down, and then pushing the urgency. That’s important in all these sales ads, that you want to have a sales window. You don’t just wanna have an ongoing forever run sales ads after a webinar. There needs to be urgency, if you don’t want the price to raise, and that’s not the way you like to market which is fine, then the doors should close. You should use Deadline Funnel or something that actually redirects the page after the time limit is up for each round of people. If there’s no urgency, it will really hurt your results. I all the time hear people say, “Well, I hate that fake marketing urgency.” Well, don’t make it fake. Put Deadline Funnel on the page, and make it redirect for everybody, ’cause if there’s no urgency, they’re humans, and they will just wait and put it off, and you will be frustrated with your results. You need to have some reason for somebody to take action while it’s fresh in their mind. They just attended the webinar, they have 2 or 3 days to buy, and you have to push them because they’re humans. It’s not scammy marketing. I don’t like you to fake say it. That’s why I put Deadline Funnel on there. Deadline funnel will redirect. I have pages of my own that I can’t get to because of Deadline Funnel, so I have to go … my team has to do it for me. So, make it real, the redirect, but put some form of urgency there so that people take action. So those are the 4 ads and I’ll recap them. So the 24-hour reminder ad, that is used for live webinars only where you’re pushing, the goal is get people on live, you put the date and the time of the webinar, you get people excited about coming. The engagement ad is about building some trust with your audience in between when they sign up for the webinar and the webinar happens, and you want them engaging with you. Ask them a question. Connect it to Manychat to give them a bonus PDF. That is run during a live webinar as well. It doesn’t work to run that for an Evergreen webinar, because most of the time Evergreen is happening in a couple hours. Replay ads is for anyone who has signed up for the webinar and not attended the webinar, and is either sent back straight to the replay or to re-register for the next webinar. Re-registering, my preference, and what I believe converts better. This could be used for both Evergreen and live webinars and launches. It’s a great thing to include in there to get your live show up rate or your show up rate and watch rate higher. Finally, sales ads, but multiple sales ads layered in based on the action that the lead has taken. It’s so important for you to think about this. A lot of people will make one single sales ad and show it to all their webinar attendees, and not a lot of thought goes into it, and I want you to think about actions that they have taken, that they need to hear. Like, what do they need to hear to make the commitment to buy? Your sales ad should tailor that to all the different levels, so did they watch the webinar or not? Have they visited the sales page or not? Are they on your list? Are they a super warm lead or did they just sign up for the webinar and they’re a colder lead? Map it out. What we do for our clients is a campaign planner, so literally in a spreadsheet, we have all the audiences that we’re gonna target, so for the sales ads, the different audiences would be webinar attendees, webinar registrants that didn’t attend, our email list, like if we’re targeting them for a live launch. People who have visited the sales page. People who have visited the cart page and not purchased. Whatever the audiences are gonna be, and then that way we can make sure our messaging matches those audiences. If you want somebody to do this for you, to set up this strategy for you, we have a very templated effective way of doing this for clients. Go to helpmystrategy.com and apply to work with the Hirsh team. We have been super busy overhauling our client onboarding and actually getting even more specific and strict about who we accept in our agency, so we only … and this is not fake marketing, we only have a few more spots left and I don’t say yes to everyone, because I wanna get 100% results for my clients. If you feel like you might be a fit for the agency, go to helpmystrategy.com. See if our team can maybe help you, and if not, go and apply these webinar ads to your strategy. Tag me, let me know. I love when you guys share after you listen to the podcast, kind of like any takeaways you had or how it helped you, because this is the key to webinar ads, is squeezing out the value of the lead that you already paid for. All of these ads are pretty cheap to run. Obviously depending on how many people are in your audience, how many webinar attendees are in there, but some of like $5, $10 a day will get you fine. Enough to reach to reach everyone. So that’s huge because it can make a huge difference in your results. Thanks so much for listening today guys.